CM Magazine: On the Wings of a Dragon. On the Wings of a Dragon. ...Each morning an old woman with gnarled hands brought fresh water, placed it on the plain wooden stand that was the only piece of furniture in the small room, dropped Kour'el a courtesy and left without a word. She would have liked to see the old woman's face but it was always hidden by the thick folds of the hooded cloak that covered her face and swathed her body to shapelessness. Only the hands indicated that the person inside was old - and a woman. 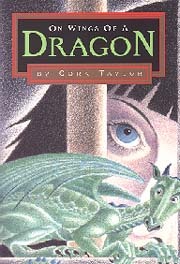 Some of Taylor's previous titles, such as Julie and The Doll, contained elements of fantasy, but, with On Wings of a Dragon, she steps fully and superbly into the world of high fantasy. Divided into two parts, the book is captivatingly plotted. The 27 chapters in "Part One" alternate narrators, with the odd numbered chapters being told from the perspective of Kour'el who initially appears to be a young girl, one without memories and, therefore, ignorant about the reasons for her imprisonment in a tower. Maighdlin, a 14-year old girl, and her GrandDa, Petaurus, advance the action in the even numbered chapters wherein readers learn that a once happy and prosperous kingdom has fallen on hard times since its beloved king was grievously injured. While the people are uncertain whether or not King Vassill still lives, they do know that his beautiful wife, Queen Mariah, rules ruthlessly in his name. The queen's power is felt in the village when her soldiers arrive and inform the people that "all maidens of twelve to fifteen summers are required to leave now to perform service at the palace of Her Majesty. Those who do not come immediately will be hunted down and imprisoned." Petaurus, who had been the king's favorite huntsman and who had also been present when the king was "mysteriously" injured, is determined to rescue his cherished granddaughter, and he is joined by Young Bred whose betrothed, Marika, had also been pressed into the queen's service. Now, this quest of the old and the young man to rescue the village's maidens from an evil queen would have been sufficient grist for a most engaging fantasy plot, but Taylor also presents Kour'el's chapters which initially will likely cause readers to wonder if they have any connection whatsoever to what appears to be the principal action involving Petaurus and Maighdlin. Through dream fragments, Kour'el gradually recovers her memories, and readers are able to piece together Kour'el's extraordinary story which links her fate with that of a winged dragon, ApiNaga, who has been killed and who is "recreating" himself. Kour'el is not what she originally appears to be (a surprise I'll leave for your reading), but she and ApiNaga were also on a quest, one which overlaps with that of Petaurus and Brede. "Part One" concludes with readers learning that King Vassill is still alive. The shorter Part Two, which utilizes a wider variety of narrators, links and brings to a satisfying close the quests of Petaurus and Kour'el. Taylor provides lots of action and suspense while offering one final surprising twist at the book's conclusion. Best of all, not all the "bad people" are destroyed, and so the possibility of a sequel exists. On Wings of a Dragon merits at least two readings. During the first, readers can simply allow themselves to be swept up in the story, but, in the second, they should explore how Taylor, almost like a mystery writer, has provided ample "clues" throughout to Kour'el's identity and her link to Maighdlin. An absolute "Must-Buy" for all libraries serving Middle Years readers. Dave Jenkinson, teaches courses in YA literature in the Faculty of Education, the University of Manitoba.